Socrates (ca. 470-399 B.C.) - Of the many fields which flourished in Classical Athens, one of the most well-known was philosophy; and Socrates is one of the men who got it all started (in the West. Confucius would probably be considered the founder of philosophy in the East). One thing that is so remarkable about him is that he never wrote down a single teaching; not one. Because of his profession, most people naturally assume that he was a prolific writer. Despite this, he remains one of the most prominent figures of the Classical Period. How can this be? Well, it's because he had such a profound influence on Athenian society. The historian, Xenophon, was a famous student of his who recorded some of the events of his life. But it was his even more famous student, Plato, who wrote the most about him. There is also a third contemporary source about Socrates which does not paint him in a favorable light. The comedian, Aristophanes, wrote a play, The Clouds, which pokes fun at intellectual thought in Athens and Socrates is a primary character. At the time of its performance, it was largely rejected by Athenians, coming in last at the Dionysia. 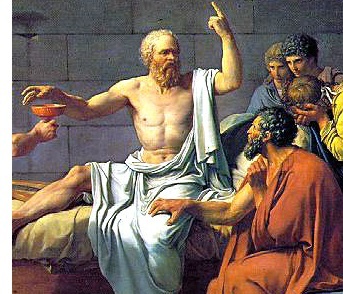 However, in his Apology, Plato points to it as a contributing factor in Socrates' eventual trial and execution. Learning anything about his life is problematic in that the sources are all clearly biased. Plato, who is considered the most credible source, focuses almost exclusively on his philosophical views. And in fact, most modern scholars agree that Plato was channeling his own views through his writings of Socrates. We can turn to the historian Xenophon, but his account is written more as an admiring student, than a dispassionate chronicler. And, of course, Aristophanes can only find fault. In the end, we know that Socrates was brought to trial by three accusers on charges of corrupting the youth of Athens and for impiety. He was narrowly convicted and forced to commit suicide by drinking hemlock. Plato records the speech he gave in his own defense, though it is likely embellished. His most famous saying was, "I only know that I know nothing." He is also considered the author of the eponymous "Socratic Method", which is a form of vigorous debate in which the two parties question each other in order to illicit critical thinking.